Prepare Yourself: Every cleaning company is a little different. Don’t be afraid to ask questions! 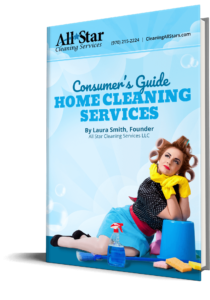 You want to make sure that you are on the same page as your cleaning service, and you don’t want to end up expecting things to be done if they are not offered by your service. Check out the company’s website, send them a quick email, or give them a call if you aren’t sure if they provide certain services like laundry, organization, or outdoor cleanup. Put Away Pets: If you have aggressive pets, you should absolutely have a plan in place to keep the cleaning team safe when they arrive, but it’s also not a bad idea to keep your pets put away even if they are tame. Sometimes it’s the friendly pets that make it difficult for cleaners to do their job. It’s hard to clean when you have a loveable 40-pound golden retriever under your feet. Prepare Your Team: Have special requests? Let them know! You can definitely leave a note for the cleaning team to let them know, but the most effective way to relay information is to contact your service directly. Most cleaning services have plans in place to relay information to their employees, so you don’t have to worry about them not seeing the note, or not realizing that it was left for them. There’s nothing quite like coming home to a spotless house (that you didn’t have to clean.) If you follow these quick tips, you’ll be ready to experience the wonderful world of hiring a professional cleaning service.